A man looks through the sight of a Toophan launcher. The Toophan (Persian: طوفان‎ "Storm", rarely Toofan) is an Iranian SACLOS anti-tank guided missile reverse-engineered from the American BGM-71 TOW missile. The Toophan 1, an unlicensed copy of the BGM-71A TOW missile, began mass production in 1988 and the Toophan 2, a BGM-71C ITOW variant, was publicly shown in 2000. The Toophan comes in at least 11 variants, many of which are poorly documented, including variants with laser guidance, thermobaric warheads, and tandem-warheads with increased penetration. The Toophan is manufactured jointly by the Aerospace Industries Organization of Iran and Iran Electronics Industries. The Toophan is normally deployed from ground-based tripods, and can also be mounted on fighting vehicles and helicopters. Like the BGM-71 TOW missile, the Toophan is a large, rugged, powerful, and reliable anti-tank guided missile deployed by small teams against tanks, armored vehicles, buildings, and other targets. The Toophan forms the backbone of the Iranian Armed Forces's ATGM inventory and is procured in large quantities in a variety of variants. The Toophan has been exported to the governments of Iraq and Syria and to a large number of non-state actors in the Middle East, and has been used in the Iran–Iraq War, the 2006 Lebanon War and the Iraqi, Syrian, and Yemeni Civil Wars. Iran was among the earliest countries to import the TOW missile, as far back as 1971. Extensive repair and assembly facilities were set up at the Iran Electronics Industries (IEI) by the Texas-based Emerson Energy Systems, as well as Hughes Missile Systems, to repair TOW and FGM-77A Dragon missiles. In May 1975, negotiations between Iran and Hughes Missile Systems on co-production of TOW and AGM-65 Maverick missiles stalled over disagreements in the pricing structure. Hughes set the royalty and initial investment costs for Iran at $20 million for the TOW and $25 million for the Maverick. The subsequent Iranian Revolution in 1979 ended all plans for such co-production. The Toophan 5 is the most advanced variant. The Iran–Iraq war lead to Iran having an acute need for anti-tank guided missiles to counter Iraq's massive armored formations, leading Iran to import thousands more TOW missiles, as well as Soviet AT-3 Sagger ATGMs. Attempts at local production of both systems began in the first half of the war, with the TOW missile being prioritized due to its better performance. The earliest prototype version was ready in mid-1985, but performance was disappointing compared to Iran's US-made TOW missiles, which received widespread praise in Iran at the time. Following about a year and a half more of R&D work, the Toophan was tested against Iraqi tanks and showed better performance. The missile was shown on an Iranian TV show on March 21, 1987, and production of what would be named the Toophan 1 began by early 1988. R&D and production work continued through the 1990s. The missile was not publicly revealed until 2000, when the Toophan 1 and Toophan 2 were publicly unveiled at the same time. The Toophan has since become Iran's primary anti-tank guided missile. The Toophan's guidance unit is produced by Iran Electronics Industries. 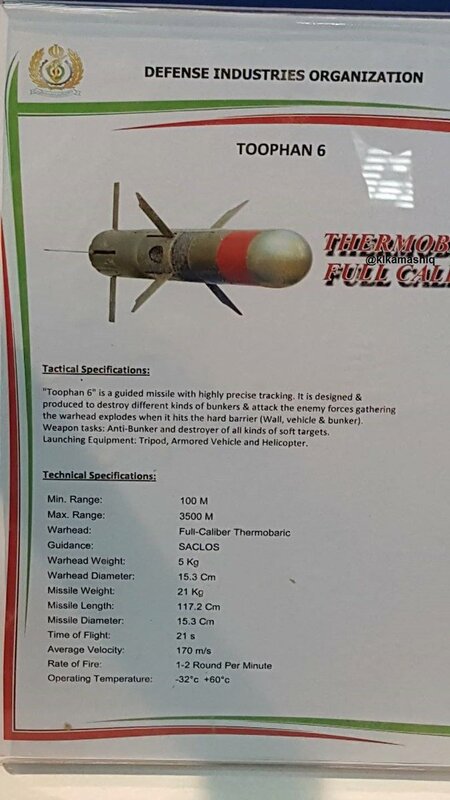 In addition to Toophan missiles, Iran also produces reverse engineered tripod launchers, guidance sets, and storage boxes, all of which bear the Toophan name. Toophan missiles can be fired from TOW launchers, and their components are generally interchangeable. A number of sources say that the Toophan's quality is inferior to that of original American-made TOW missiles, but is still robustly capable. In 2014 Iran showed a Toophan/TOW simulator they built for helicopter-launched missiles. In a December 2016 military exercise Iran used the missile against naval targets. In 2018 Iran showed off thermal-sights which can be used with the Toophan. The Toophan can be mounted on Boragh APCs, ATVs, or Safir jeeps. Toophan missiles can be repaired by Iran's Shiraz Electronics Industries. The Toophan was later developed into the Sadid-1, an ambitious project to build a competitor to the Israeli Spike-ER fire-and-forget missile for attack helicopters and drones. The Sadid-1 had limited success, but was used to develop the successful Sadid-345 glide bomb, which in turn spun off a smaller counterpart, the Qaem air-to-ground munition. Prototype versions of the Toophan-1 were used in the tail end of the Iran–Iraq War. A Toophan launcher without a missile loaded. Hezbollah received Toophan missiles in the early 2000s and used them against Israeli Merkava tanks and other vehicles during the 2006 Lebanon War. The Toophan missile has seen extensive use in the Syrian Civil War. Hezbollah has used Toophan missiles in the war and is one of the missile's most prominent users. The missiles have also been provided to the Syrian Army and Iranian-backed Shiite militias in Syria. Toophan missiles first appeared in Syria reportedly in October 2015. Overall the Toophan missile's use in Syria is poorly documented, but Toophan-1 missiles seem to be the most common. Furthermore, the secular YPG militia has used Toophan 1 missiles as well. The missiles have since proliferated to a wide range of non-state actors operating in Syria. In addition, Toophan missiles have been captured by groups fighting the Syrian governments, including ISIS and al-Nusra. A Toophan missile, unidentified variant, found in Yemen. The first known Iraqi group to receive Toophans was Asaib-Ahl-Al-Haq in 2014. The Badr Organization obtained Toophans in 2015 and the Toophan has since been provided to other Shiite militias organized under the Popular Mobilization Units. Iraq's Federal Police have also been delivered Toophans. Iran has shipped Toophan missiles to the Houthis in Yemen as well, where they have been used in combat. The first video of Houthis using a Toophan missile was published in November 2018. A US DOD sign on Toophan missiles. Identifying Toophan missiles is hard. The Toophan ATGM is very similar to the American BGM-71 TOW ATGM on which it is reverse engineered. Toophan missiles, launchers, control units, and crates are essentially interchangeable with their American counterparts and are regularly mixed together. The many variations of TOW and Toophan missiles also poses challenges. 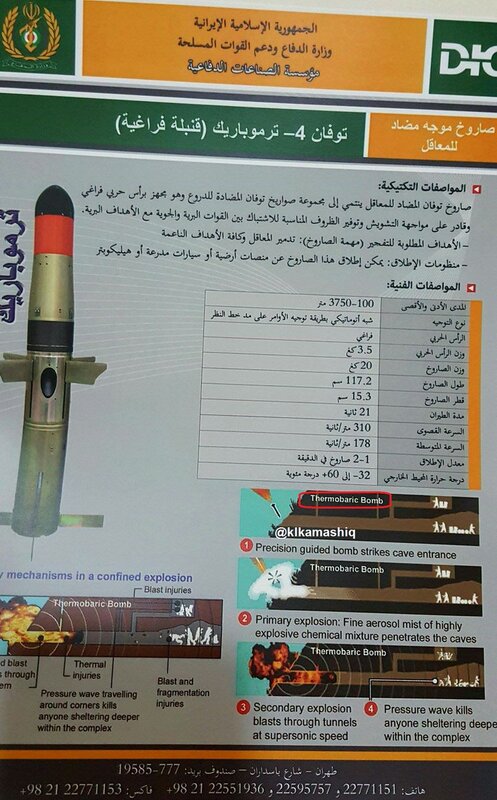 Toophan missiles can often be identified by their turquoise bands installed by Iran's Defense Industries Organization or by a faint black band on the rear end of the launcher. Toophan missiles, on their packaging, are instead labeled as TOW missiles; for example a Toophan 2M is labeled as a "TOW 2M". Modern TOW tripods have black rings, while Toophan tripods have yellow rings. Internally, Toophan missiles have different screw placement and cylindrical launch motor nozzles. Toophan 1 3.5 km 550 mm 116 cm 18.5 kg  BGM-71A TOW clone. The Toophan-1's payload is a 3.6 kg HEAT warhead. The top speed 310 m/s. Exported to Hezbollah of Lebanon in the 2000s and Iraqi forces in the Iraqi Civil War. Toophan-1 marketing material claims a hit probability of 96%. Entered production 1987/1988. Toophan 2 3.5 km 760 mm 145 cm 19.1 kg  Derivative of BGM-71C TOW missile with a tandem HEAT warhead; possibly incorporates elements of BGM-71E TOW 2A missile. Revealed in 2000. Toophan 2M 3.75 km 650 mm 147 cm 21 kg  Tandem warhead. Exported to Iraq. Toophan 3 3.5 km 80 mm 116 cm 19.1 kg  Derivative of American BGM-71F TOW 2B top-attack missile albeit with worse performance, introduced c. 2016. Possibly exported to Hezbollah (Lebanon) and Kata'ib Hezbollah. Toophan 3M Toophan 3 derivative with unknown changes. Top attack ATGM. Revealed in 2019. Toophan 4 3.75 km N/A 117.2 cm 20 kg  (in Arabic) Variant with thermobaric fuel-air warhead. Exported to PMU forces in Iraq and used in the battle of Mosul. Also exported to Houthis in Yemen. First shown to the public in 2017 but in use since at least 2015. Like all Iranian thermobaric weapons, has a distinctive red band. 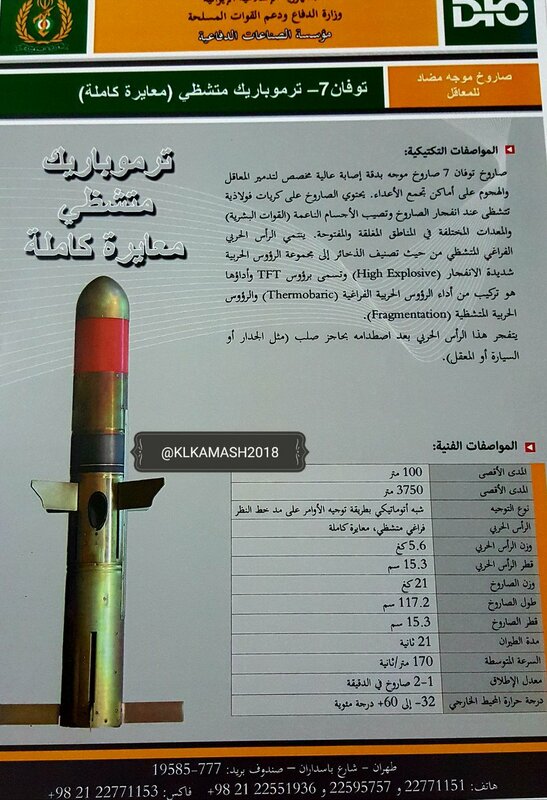 Toophan 5 3.5 km 900 mm 145 cm 19.1 kg  (in Arabic) Considered the premier Toophan variant, the Toophan-5 has laser guidance, tandem-warhead and canards. Was apparently in development in 2002 and entered production in 2010. Exported to Iraq and used by Iraqi Federal Police in Ninawa province and elsewhere. As a laser-riding missile, it requires a different launcher. Not a copy of any TOW variant. Qaem Anti-helicopter variant with laser guidance and secondary flight motor. Mass production began in 2010. Qaem-M (or Ghaem-M) 6 km N/A 116 cm 19.5 kg  Qaem variant with proximity fuze. Toophan 6 3.5 km N/A 117.2 cm 21 kg   Anti-bunker thermobaric warhead. First shown to the public in 2017. Perhaps laser-riding. Unclear differences compared to Toophan-4. Toophan 7 3.75 km 117.2 cm 21 kg  (in Arabic) Unclear warhead, perhaps fragmentation thermobaric. All data from Aerospace Industries Organization. Penetration values are claimed, not proven. As in common in Iran, the "Toophan" name has been reused for many separate, unrelated weapons systems. Iran produces a UAV, IRAM, MRAP and a jeep under the Toophan name. The Toophan-1 name is also used for heavily repaired AH-1J Cobra helicopters, while the Toophan-2 name is also used for an upgraded variant of the AH-1J Cobra helicopter. Toophan-2 helicopters are able to fire Toophan missiles. ^ a b "Arms Deliveries to Iran and Self-Sufficiency". Defense Intelligence Agency. 24 February 1988. ^ a b Pike, John. "Toophan". www.globalsecurity.org. ^ a b Galen Wright (October 1, 2015). "Saudi-led Coalition seizes Iranian arms en route to Yemen – Armament Research Services". Armament Research Services. ^ آشنایی با موشک‌های ضد زره ایران. hamshahrionline.ir (in Persian). ^ a b c d e f اعلام رسمی دستیابی ایران به موشک ضد زره با سرجنگی «ترموباریک»/ ۷ عضو پر افتخار خانواده «توفان» تکمیل شدند +عکس (in Persian). mashreghnews. ^ «توفان 3» مرگبارترین موشک ضدزره ایرانی با سرجنگی ویژه +عکس (in Persian). 23 November 2014. ^ Lyamin, Yuri (5 October 2012). Легкое противотанковое вооружение Ирана. Часть 1 (in Russian). ^ "Toophan Missile Advanced Guaidance Set". 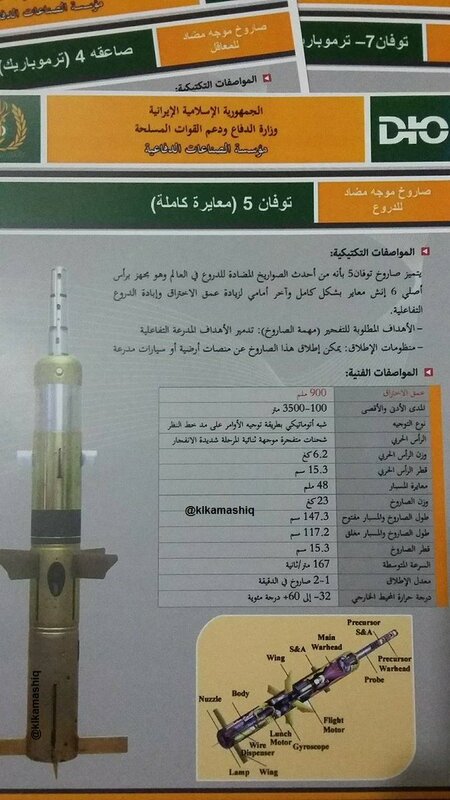 IRAN Defence Products. ^ a b Sina Military (March 23, 2018). 土耳其坦克被打爆祸首到底是谁？这次真不是陶式导弹 (in Chinese). ^ "رونمایی از شبیه ساز تاو و شینوک". 25 May 2014. ^ "New Interceptor Missiles Fired in Iran Military Drill". Tasnim News Agency. 12 December 2016. Retrieved 12 December 2016. ^ "Iran Builds Thermal Imaging Infrared Cameras (+Photos) – Tasnim News Agency". ^ Lyamin, Yuri (24 May 2012). Противотанковые квадроциклы.. (in Russian). ^ Lyamin, Yuri (20 February 2017). Парад сил народного ополчения Ирака в священном шиитском г.Эн-Наджаф (in Russian). ^ "A l'encontre » Syrie. Alep: les milices chiites en première ligne". alencontre.org (in French). December 8, 2016. ^ "Adam Rawnsley on Twitter". ^ Mikhail Barabanov, scientific editor of Arms Export (2006-08-23). "Hezbollah's Examination". Kommersant. Retrieved 2014-01-08. ^ Hamid Reza Ghorbani. موشک توفان؛ گردبادی که در 33 روز اسرائیل را شخم زد (in Persian). ^ Zimmt, Raz (February 14, 2016). "Spotlight on Iran (January 31 – February 14, 2016)" (PDF). The Meir Amit Intelligence and Terrorism Information Center. ^ ابنا, اختصاصی (31 January 2016). سلاح پیشرفته ایرانی در دست رزمندگان لبنان در سوریه + عکس (in Persian). AhlulBayt News Agency (ABNA). ^ a b Rodríguez, Yago (16 March 2016). "Tipos de misiles guiados antitanque en Siria (Capítulo/serie 2.1)" (in Spanish). ^ Aldin. "#ISIS in #Iraq using #Iran Toophan ATGM to destroy #ISF HUMVEE near Shirqat". twitter.com. ^ "The discreet use of BGM-71 TOW ATGM in Iraq points to Iran". aerohisto.blogspot.ae. ^ a b c Rawnsley, Adam (June 18, 2016). "Iranian TOW Missile Knockoffs Spread to War Zones". War is Boring. ^ O'Neill, Kara (31 March 2016). "Iraqi soldiers celebrate after foiling ISIS car bomb attack with missile". ^ ali javid (7 April 2016). "Toophan ATGM missile used by resistance in Iraq to take out terrorist suicide car bomber" – via YouTube. ^ Jim Garamone. "DoD Shows Iranian Weapons as Proof of Tehran's Duplicitous Ambitions". DoD News, Defense Media Activity. ^ Lyamin, Yuri (30 Nov 2018). Хуситы с ПТРК TOW или более вероятно с его иранской копией Toophan (in Russian). ^ a b c d Lyamin, Yuri (25 July 2015). Иранские TOW в Ираке (in Russian). ^ a b Lyamin, Yuri (31 January 2018). Пуск курдами ПТУР Toophan по турецкому надувному макету танка (in Russian). ^ a b c d Lyamin, Yuri (10 May 2016). Маркировка иранских "Туфанов" (in Russian). ^ Photo by EJ Hersom (January 24, 2018). "Iranian Weapons Proliferation Evidence". ^ "Army Reconn article on Iranian copies of DRAGON and TOW". ^ KLKAMASH. "Toophan 1 and Toophan 4 #Iraq". ^ a b "iranmilitaryforum.net". www.iranmilitaryforum.net. ^ "Index – The First Military Reference Forum Site in Iran". military.ir. ^ KLKAMASH (25 March 2017). "Toophan-2 B #mosul #Iraq". ^ "Iranians Mark Anniversary of Islamic Revolution with Nationwide Rallies". ^ «22 بهمن 96»-8-جدیدترین موشک ضدزره ایرانی با نام "توفان 2 – M" رونمایی شد + عکس - اخبار تسنیم - (in Persian). Tasnim. ^ KLKAMASH. "Toophan 2M or TOW-2M #Mosel #Iraq". ^ Galen Wright. "Iran shows Toophan-3 anti-tank guided weapon at Baghdad arms expo". Armament Research Services. ^ Michael Knights, 30-Sep-2011. Shia strength – Iraqi militants adapt to the US drawdown. Jane's Intelligence Review, Terrorism and Insurgency. IHS Global Limited. ^ lemon, Green. "#Iraq Clear picture of Iranian "TOW 4" ATGM carte. Probably a Toophan 4 variant. h/t @IraqiSecurity". ^ KLKAMASH. "Toophan-4 in #mosul #Iraq #Iran #ISIS". ^ a b Babak, Sheykh. "Misagh MANPAD & Toophan anti tank missile family. Toophan 4 & 6 were seen here for the first time". ^ a b c Lyamin, Yuri (24 March 2017). Варианты иранских ПТУР Toophan (TOW) (in Russian). ^ KLKAMASH (25 March 2017). "Toophan-5 tandem warhead / Toophan-6 Thermobaric / Toophan-7 High Explosive -TFT". ^ a b c d "PressTV – Iran starts mass-producing 2 new missiles". Press TV. Feb 6, 2010. Archived from the original on March 5, 2016. ^ a b "Iran: Qaem, Qaem-2 and Toophan-5 missiles". www.tacticalreport.com. ^ Inbar, Tal (29 June 2016). "Iran delivers "Toophan 5" anti-tank missile systems to Iraqi Armed Forces. @UANI @ReutersIran @OpallRome". ^ Sumeri, Haidar. "Iranian Toophan-5 ATGM being used by #Iraq's Federal Police in Ninawa ops". ^ Sumeri, Haidar. "#Iraq's Federal Police have received Toophan-5 ATGMs from #Iran. Good weapon for dealing with VBIEDs". ^ Lyamin, Yuri (20 July 2017). Иранская экспозиция на МАКС-2017. Часть.1 (in Russian). ^ KLKAMASH. "TOOPHAN- 6 #Iraq #Iran أرشيف معرض الأمن والدفاع 2017 / بغداد". ^ a b Rawnsley, Adam. "...mixed up with the Toufan-2 helicopter which is actually based on the Sea Cobra and can fire Toophan TOW copy missiles". ^ Özkök, Ali (29 August 2017). "#Iran revealed an interesting armoured vehicle for the border guard: Toophan MRAP". ^ Babak, Sheykh (29 August 2017). "A better pic, Left to Right : Toophan MRAP, Yuz armoured car, Unknown APC & Rakhsh". ^ صاعقه و طوفان برای دشمنان، سفره ماهی برای آیندگان + عکس (in Persian). 19 October 2011. ^ Stijn Mitzer and Joost Oliemans (17 September 2014). "Oryx Blog: Iranian fighting vehicles". ^ GRAD, BM-21 (27 April 2016). "SyAA soldier with Iranian Toophan ATGM (BGM-71 TOW copy) today, likely in Aleppo". ^ Lyamin, Yuri (14 October 2015). Иранские копии ПТРК TOW у правительственных сил в Сирии (in Russian). ^ "Green lemon on Twitter". ^ Aldin. "Mounted Toophan ATGM in Southern #Aleppo #Syria used by Harakat Hezbollah al-Nujaba". twitter.com. ^ Lyamin, Yuri (14 August 2016). Иранский ПТРК Toophan у федеральной полиции Ирака (in Russian). ^ Aldin (30 July 2016). "#Iran Toophan ATGM shown in the latest video of #Palestine Al-Quds Brigades #Israel". twitter.com. ^ Behnam Ben Taleblu. "Discerning Iran's Role in Expanding Houthi Rocket Capabilities – Foundation for Defense of Democracies". www.defenddemocracy.org. Archived from the original on 2017-03-01. Retrieved 2017-02-28. Wikimedia Commons has media related to Toophan.